First, dozens of Texans players knelt during the national anthem as a rebuke to team owner Robert McNair and his comment about ”inmates running the prison.” Then, quarterback Deshaun Watson and Houston went back and forth with Russell Wilson and the host Seattle Seahawks in the game of the season so far. Thanks to a pair of QBs at the height of their powers, this game had all sorts of thrilling offense, four fourth-quarter lead changes and quite a finish. Hard to imagine Texans coach Bill O’Brien thought it was a good idea to make Tom Savage his starting quarterback at the beginning of the season, but at least a change of heart came during Game 1. Watson is clearly the real deal, and he showed that again by throwing for 402 yards and four touchdowns, including a screen to wideout DeAndre Hopkins that wound up going 72 yards for a 38-34 lead with 5 minutes left. Watson’s 19 scoring throws are the most through a rookie’s first seven games. Wilson, meanwhile, began his go-ahead drive with 99 seconds on the clock and zero timeouts, but he took the Seahawks 80 yards lickety-split, capped by an 18-yard TD toss to Jimmy Graham with 21 seconds to go. Hours earlier, the statement of the day came on the sideline, with all but 10 Texans players dropping to a knee during ”The Star-Spangled Banner” – just as the whole matter of anthem actions seemed to be receding. McNair’s comment , and the response it brought forth from Houston’s players, made plain that the conversation about the anthem, players’ activism and the relationship between the league’s bosses and employees is still going to be ongoing. Thanks to a simple formula – a turnover-forcing defense and great running by LeSean McCoy – the Buffalo Bills are in serious danger of ending their league-worst 17-year playoff drought. Buffalo improved to 5-2, its best start since 2011, by beating the fading Oakland Raiders 34-14 . McCoy gained a season-high 151 yards, including a 48-yard scoring run, and Buffalo’s defense had its fourth consecutive game with at least three takeaways. Plus, the Bills are 4-0 at home – and the cold-weather advantage hasn’t even truly kicked in yet. 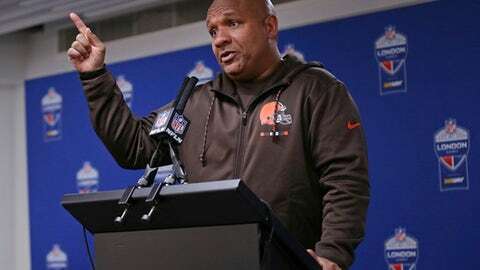 No real surprise here, but two teams reached the season’s midway point at 0-8, so let’s start the 0-16 watch for the Cleveland Browns and San Francisco 49ers. The Browns lost to the Minnesota Vikings 33-16 in London, while the 49ers were beaten 33-10 by the Philadelphia Eagles, who lead the league at 7-1.